It all boils down to expected return vs. risk. you should get a very small number, a number that is less than your ticket price. This is obvious, otherwise the lottery operation wouldn't be able to make any money after paying out the prizes. A function multiplying the value of success, by the chance of actually succeeding is called by statisticians a "utility function." As an investor, what you should be looking for, are investments that maximize the value of your utility function. Of course, you need a good utility function first. And before that, you need to look for variables which have some predicting value. If there are any variables with predictive power, you should be able to find those by analyzing the data. So how do we find a good utility function? Predicting the future is hard. There's no magical always-correct utility function for financial assets. Actually, it is worse than that. Financial data is generally "noisy", with a lot of randomness dominating it. And lastly: variables that have predictive power change with time. What works one year, may or may not work in the following year etc. The best an investor can do is to make educated guesses and mine the raw data looking for reasonably good predictive parameters, then use those parameters as inputs to utility functions. All this, while being aware that there's no guarantee and make contingencies for the cases when things go wrong. This is, in a very simplifed way, what building a model is. A very common mistake among novices looking for magic formulas, is to "overfit" the formula to maximize past performance, also known as "mining fool's gold". Whatever utility function one comes up with, must be evaluated using careful "cross-validation". Namely: never using the whole data to create the function, but to use part of the data to figure out good parameters, then use the rest of the data to test how good the model/function performs on independent data. When dealing with time series, which is very common in finance modelling, this is even more important since different time periods may be overlapping. Overlapping means they are no longer independent. Be careful here. In other words: good practice in data-mining dictates that you "train" the model on data you randomly select, and then test it against independent data you have set-aside before creating the model. One nice thing is that you can split the data multiple times in different ways as long as the two data sets are independent, you can perform multiple random experiments with the same data-set. The machine-learning term for "set aside" is "hold-out". If you split the data N times, machine learning practitioners call it "N-way" or "N-fold" cross validation. Only after cross-validation telling you the model is reasonably good, you may use the model to try and predict real world values. But you should be even more careful. While the model may give preference to a certain choice (e.g. top scoring ETF) keep in mind that it may always be wrong or inaccurate. The past doesn't guarantee the future. So even when armed with a utility function which you like, and which has performed well during multiple cross-validation sessions, you should still diversify among several choices of the function and be prepared for some surprises. Be fact driven. Never rely on hunches (or worse: hopes) only. Apply what you learned (the model) to real life. OK, so what parameters can we look at? As an example: value and growth rates have small positive correlations to future returns. If your time horizon is very long, value can be a pretty good predictor of future return. Professors Eugene Fama & Kenneth French found that domestic (US) small-cap, value stocks outperform any other domestic asset-class (based on market cap and value) in every 20-year span since 1926, no matter what the starting point is. The problem is that one can find shorter periods (e.g. 1990-2000) where growth and large-cap greatly outperformed small cap and/or value. Can you wait 10 years while your investments underperform and stay the course? I know I can't. 10 years is a very long time. Looking at value alone and staying the course may work for certain people, but these investors are very rare. As Warren Buffett says: "It (investing in deep value) is simple, but it is NOT easy." Is feasible: We feel comfortable with. That is matching our investment style and comfort-zones. e.g. any strategy that requires day trading is ok for BGI, but a personal no-no for me. Is consistent: statistically significant, works on different periods in the past, etc. We need to be careful not to fall for random patterns showing in the data. The above chart tries to combine both fundamental and technical parameters to help select ETFs that look like good investments for the next several months. These are all parameters we found to be somewhat correlated to future returns. The idea is to get even better predictive value by combining them all. Let's go over the three. Momentum: tries to capture the timeliness of buying an ETF. We are using Janet Brown's definition for momentum (average of 12 months, 6 months, 3 months, 1 month returns). Janet Brown has an impressive near 20 year record according to Hulbert Financial Digest, so we borrow this particular idea from her. That momentum has good predictive value, also matches our own data (more on that in a future piece) and others. 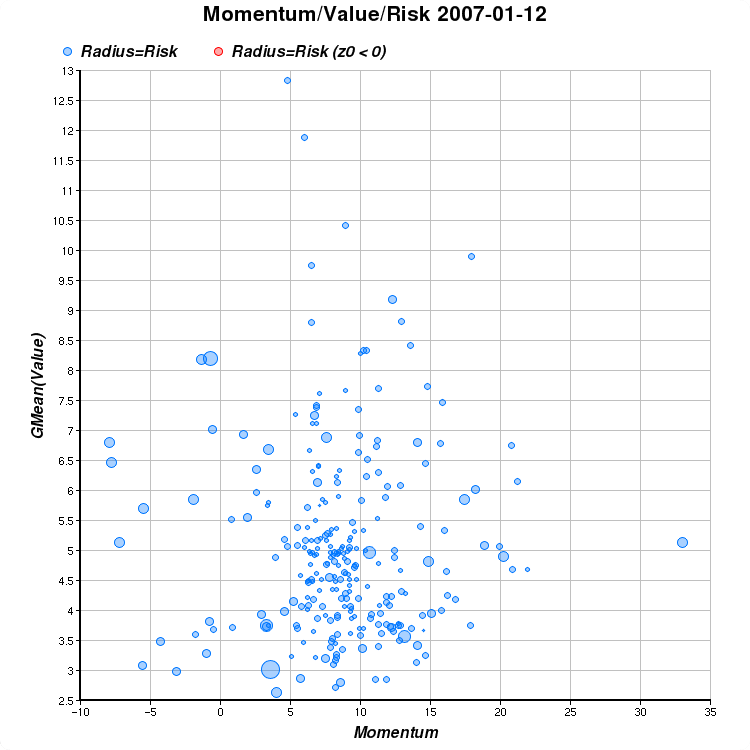 Unlike value, momentum is a good predictor of future returns for shorter periods (months to a few years) and less so for very long term (many years). All 4 have some long term predictive value, and the combination is increasing model prediction accuracy. PE's can be misleading (as the Enron story has taught many investors) P/CFs and P/Ss are more difficult to manipulate, so we use all four. By adding P/CF P/B, and P/S to P/E we are overweighting the quality of earnings. Finally, in order to match the "low price is better" concept, the scale is inverted: the best values are have low (small) Y axis values. Note that value affects both expected return (in the long term) and risk. Everything else being the same, assets with good values tend to fall less in down markets than inflated/overvalued assets. This is true especially when unsustainable earnings growth rates fail to meet expectations. Risk: last, but not least: the Z axis (represented by the radius of the bubbles,) is a purely "technical" feature representing risk. It is based on three parameters (alpha, beta, and sigma) in a linear regression of daily changes, over the past year vs. the S&P 500 (SPY). Simply put: the bigger the bubble, the more UNpredictable the asset movements are. The details here are a bit involved since a positive alpha is "good", rather than "bad", beta is "good" during bull markets, but "bad" during bear markets, and high sigma, -- also known as "fat tails" -- is always "bad". You're welcome to read about linear regression between two vectors on Wikipedia or elsewhere on the web. I'll skip the exact formula for the sake of brevity, just remember: "big bubble - bad, small bubble - good." What to look for in our chart? Z-axis (bubble radius): small: (low volatility and high consistency) as possible. The ETFs that are too far to the right (most notably China) have already made huge moves, so we should be careful not to chase them. Momentum is good, but up to a point. "Chasing" high-flying stocks can be disastrous to a portfolio. If China corrects about 20% we may consider getting in, but not now. Our screening function f(X,Y,Z) is designed to discount extreme momentum and prefer 'moderate momentum' (MM). The next ones down: Spain, Singapore, Malaysia are a mixed bag (if you jump into them, you should limit the allocation to small quantities since they had great runs already. Again, the screening function should take care of that for us. Mexico is too volatile, (big bubble = higher risk) due to its over reliance on one commodity: Oil, so the formula should discount it. I would also avoid ETFs that are too narrow/concentrated (industry specific sectors) except in extremely compelling cases. The hope is that these too are volatile, so our formula would discount them via the risk parameter. Lastly, we need to diversify among several different ETFs so even if we're wrong on some, we still have good chances of coming ahead on the whole. The f(X,Y,Z) formula doesn't do this for us yet (it is on the to-do list) so we'll have to do this part ourselves. In the US, the one that looks like one of the best are: VTV (Vanguard Value) and the Rydex 'pure value' ETFs (RZV, RFV). Internationally, many of the WisdomTree dividend weighted ETFs look good, especially DFE, DOO, and DOL. In Europe, a full basket like IEV, and countries like Belgium, the Netherlands, and Germany look the best. I deducted a star from ADRU/ADRD because they are a bit too narrow and concentrated in large-cap, for my taste (they invest only in ADRs) and the formula doesn't yet look at market caps or concentration. Staying in Europe, VGK (Vanguard Europe) is perhaps the most diversified - with over 600 companies, so it spills over from large-cap to mid-cap territory. Because of the smaller cap bias, VGK looks a bit high on the value scale (compared to the best group). Still, it looks attractive because of its diversification and the low expense ratio. On the sector side: telecommunications look good. I would go with either IXP or VOX. IXP looks better on both the value (especially P/E: 15.22 vs 17.71) and current momentum side, it is also global which is always good. VOX looks a bit better on technical risk and Vanguard's lower expense ratios but overall, IXP looks like the better pick of the two. Even though they're in deep value territory, I wouldn't jump into U.S. home-builders (ITB, XHB) just yet. For one, they are too volatile for my taste, and their decline, despite the recent bounce, may not be over yet. In this case, the formula may this screening for us (if momentum is low enough, and risk is high enough) so we get this elimination for free. Another sector looking attractive is the materials sector, represented here in VAW (Vanguard Materials VIPERs) which like energy is enjoying a strong sucking sound from the growing world economy and accelerating investments in infrastructure and consumption in the emerging world. Insurance ETFs look good too, but it may be because of luck (e.g. no major hurricanes last year, something the formula doesn't know about) so I wouldn't put too much there. I like to avoid sectors in general, I'm already invested in the international financial sector, and Telecom looks better than insurance right now on the momentum side. Below are the top 50 (out of 290 ETFs) sorted by the screen shown in the above chart. I marked my favorites with three stars (***), somewhat less favorites with two stars (**), and finally one star (*). Those that aren't marked, I don't feel sure about. The screen discounts extremes (too much or too little momentum) by weighting momentum values using a Cauchy density distribution centered (location-parameter or x0) at momentum=10.0, and with scale parameter (or half-width at half-maximum) of 14.0. Important note: there's a lot of redundancy in this screen. Many of the best picks for example are European Value stocks, an ETF like PID is very similar to DOO (both invest in international high dividend stocks). Likewise, VTV and IWD are very similar (both invest in large-cap US value stocks). Be careful, and avoid putting too much in the same basket. Pick one or two of each asset-class, mix different parts of the world. etc. Tip: to test whether two investments are similar simply chart them using the chart-comparison feature of finance.yahoo.com or similar. If the two charts are too similar, invest only in one, and skip the "duplicate." Momentum, Value, Risk: 50 out of 290 ETFs, best to good order. Just to set expectations correctly. Following all this will not make you rich quick. It is hoped (but nothing is ever guaranteed) that it will increase your assets at a moderate pace (I estimate and hope at about 4%-20%/year, 67% of the time) with as little risk as possible. If you're not happy enough with beating the US market(*) by just a little, most of the time, and with less risk, then this strategy is not for you. If you can't stand an occassional ~15% drop, you shouldn't be in the market at all. I don't feel this is a time for placing big bets. The current bull market has been going on for 4 years already, so prudence is the name of the game. There will be a time for big bets (and possibly leverage) at the end of the next bear market when there are too many opportunities to pick from. (*) Assuming the US market (S&P500) has expected (mean) return of 10%/year with a standard-deviation of about 14%/year - the comparative numbers I'm hoping for are (-4% to +24% 67% of the time).